See more objects with the tag metallic, graphic design, advertising, promotion, repetition, film poster, film, guns, bold, photography, photomontage, violence. See more objects with the color firebrick black steelblue lightslategrey dimgrey or see all the colors for this object. This is a Poster. It is dated 1996–97 and we acquired it in 2010. Its medium is offset lithograph on wove paper. It is a part of the Drawings, Prints, and Graphic Design department. The 1996 independent film "I Shot Andy Warhol" illustrates the tormented life of radical Valerie Solanas—who fired non-fatal shots at pop artist Andy Warhol on June 3, 1968, in his Factory. 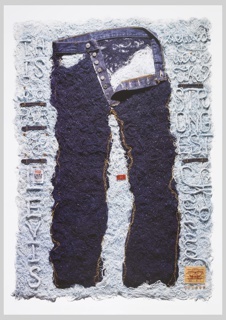 It also points out the contradicting themes of violence, revolution, celebrity, and parties that comprised 1960s New York. The poster’s black-red-blue color scheme and layered composition heighten these contradictions. 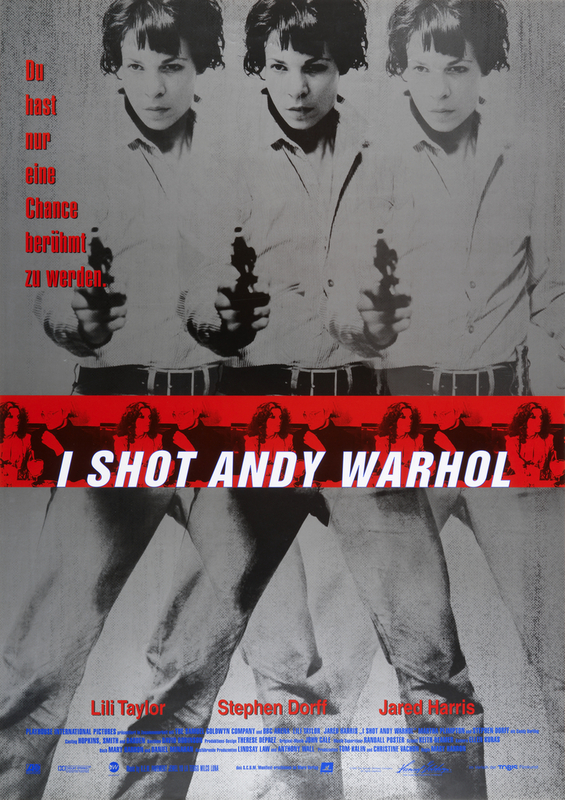 The four layers include Warhol’s own Triple Elvis painting—representing both popular culture and the number of shots Solanas fired—the head of actress Lili Taylor as Solanas superimposed over Elvis’s face, a five-repeat photograph of Warhol sitting with a woman, and the text listing the movie title, its three lead actors, other credits, and a tagline in German. The German text (English in some versions) alludes to mystery, but its translation—“you only get one shot at fame”—satirizes the lead character’s attempts at fame and the cause of her eventual recognition. The style and content of both the poster and film—for which the designers also created the title sequence—show Bureau’s interest in bridging art, design, and social messages.